In his 1911 collection, The Devil's Dictionary, American writer Ambrose Bierce defined 'romance' as "Fiction that owes no allegiance to the God of things as They Are." Ralph Eugene Meatyard, a great reader who was known to find inspiration in literature and philosophy more often than in visual media, makes reference to the passage in his 1964 photograph "Romance (N.) From Ambrose Bierce #3." While Meatyard worked on a variety of projects, from the No Focus pictures to the Zen Twig series, several features of "Romance (N.) From Ambrose Bierce #3" are characteristic of his work. Meatyard often used friends and family, particularly his children, as models in his carefully directed photographs. Likewise, the use of props was not uncommon (doll parts, dead birds, and dime-store masks were particular favorites); it is worth noting that the mask worn by the child at the bottom of the bleacher steps would later be the face of the central figure in 1969-1972's Lucybelle Crater series. As with all of Meatyard's pictures, this one was surely photographed in or around northern Kentucky. More importantly, though, it plays with deliberate ambiguity and paradox, much the way a Zen riddle is constructed to promote contemplation. At a time when photographs tended to document the world unadorned, the expressive quality of Meatyard's pictures was generally out of favor with the artistic community of the 1950s. 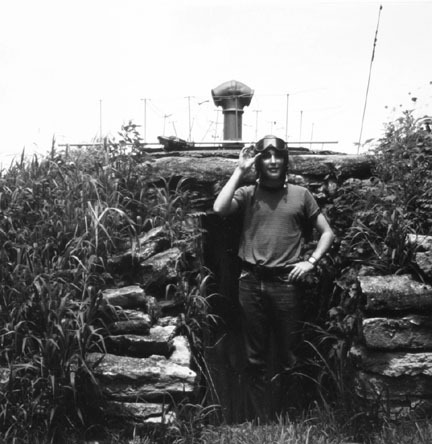 It was basically not until the 1970s that his work came to any notable prominence. Though he assigned himself the title "amateur" (and wore it proudly), he was long disappointed that his contributions to photography were not more widely recognized. In response to his omission from the 1964 edition of Beamont Newhall's seminal History of Photography, Meatyard mounted a print of "Romance (N.) From Ambrose Bierce #3" as the frontispiece in his own copy. Ralph Eugene Meatyard was born in Normal, Illinois on May 15, 1925. He served in the Navy, studied pre-dentistry at Williams College (1943-44) and philosophy at Illinois Wesleyan University (1950). He began his career as an optician in 1949. The optical firm where he worked, Tinder-Krauss-Tinder, also sold photographic equipment and supplies. There Meatyard purchased his first camera in 1950 in order to photograph his newborn son. 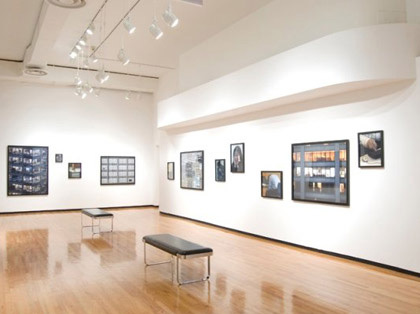 Once established in his own practice, Eyeglasses of Kentucky, he hung the walls of the reception area with rotating exhibitions of his own pictures and those of other photographers, including Emmet Gowin. 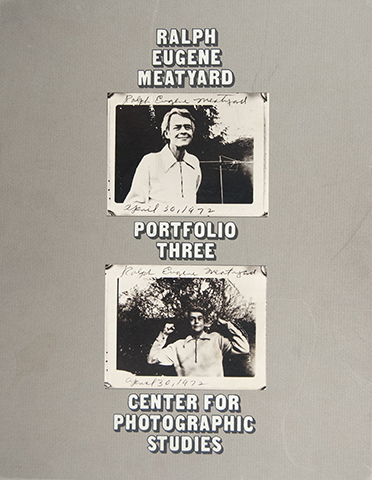 Meatyard exhibited selections from Georgetown Street, a collaborative effort with Van Deren Coke, along with other early work at Roy DeCarava's A Photographer's Place in 1957-8, and had his first solo show in 1959 at Tulane University. Throughout his career as photographer, he continued working as an optometrist at Eyeglasses of Kentucky, and was known to his friends as a devoted family man who somehow eked out time to photograph on weekends. Meatyard's interest in Eastern thinking was sparked at a workshop in Indiana where Minor White recommended a list of books crucial to a photographer's education which included two volumes on Zen. Photographs by Meatyard are in the collections of the Metropolitan Museum of Art and Museum of Modern Art in New York; George Eastman House International Museum of Photography and Film, Rochester, New York; Center for Creative Photography, University of Arizona, Tucson; Massachusetts Institute of Technology, Cambridge; Smithsonian Institution, Washington, D.C.; and University of Louisville Photographic Archives, Kentucky. He died of cancer in Lexington, Kentucky on May 7, 1972.